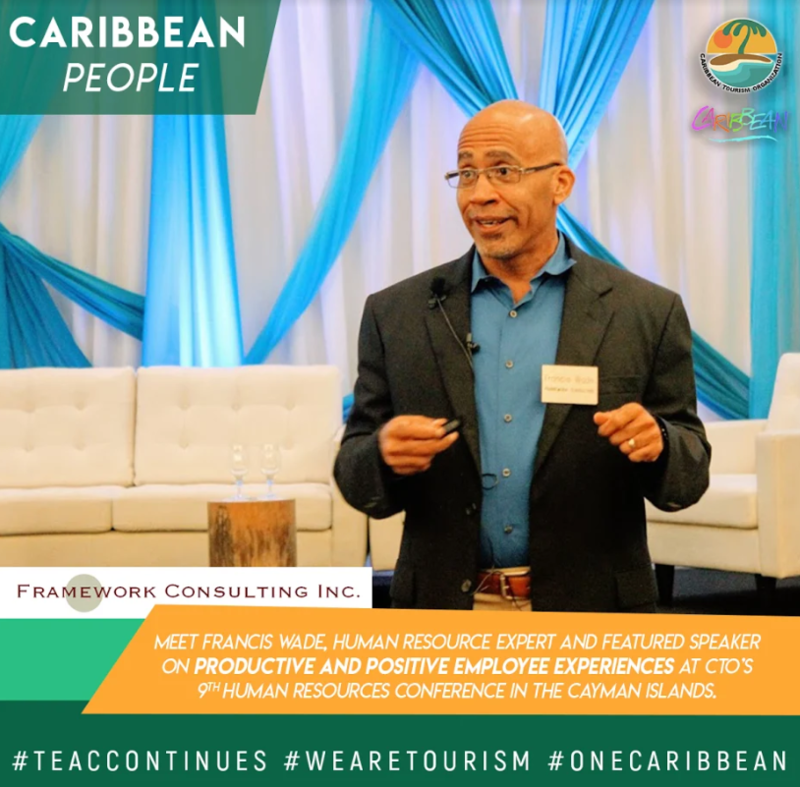 Our region is ripe with unsung heroes, those who work behind the scenes, and late into the night, to ensure that the visitor experience in their tourism business or destination, and by extension the Caribbean, is nothing short of amazing. This is our tribute to those Caribbean People, who truly help to make the region a special place to live, work and visit..
Rowan Garel’s selflessness and kind heart as well as his determination to live an independent life are the real power behind his motivation to succeed. He is an inspiration for the entire country of Belize, but especially for visually impaired or physically challenged people who seek to live an independent life. Many visually impaired persons in Belize now enjoy Belize Council for Visually Impaired (BCVI) services because of Rowan’s fund raising efforts for the organization. His humbleness and immense love for humanity propelled him to undertake such gigantic feats, which no one with his condition has ever done in Belize. He obviously faced double challenges in accomplishing his tasks, but he never gave up in his mission to advocate for the needy and visually impaired people in Belize. Despite all his personal challenges, he left his country of birth to study and live abroad. Rowan is currently completing his first year of College studies at Drew University in New Jersey, U.S.A., where besides pursuing his education, he still remains very active in advocating for the welfare of the visually impaired in his beloved country, Belize. He is an unsung hero, worthy of recognition for his unselfish and enormous passion to serve humanity and the needy..
Gabriel Abed is an experienced Founder with a demonstrated history of working in the computer software and FinTech industry. Frank has over 30 years of experience in economic development, organization management, government affairs, project management, workforce development, research, and in providing business and investor support in The Bahamas, the United States, the U.S. Virgin Islands and the wider Caribbean. Oliver Gale is the Co-Founder of Bitt, a Barbados-based financial company founded in 2012 to provide proper, unfettered access to financial systems, and empower Caribbean citizens through the use of decentralised/distributed technologies. Oliver is an honors graduate from the University of Bristol – graduating from the Finance and Management program. Oliver is a leading regional advocate and authority on digital currency, blockchain technology and their application in emerging markets. He has spoken at the United Nations ECLAC, the World Bank, the CBB as well as throughout the Caribbean and the U.S.A. Oliver is 30 years old. 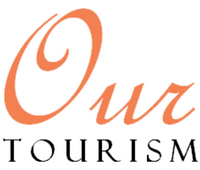 Diannille has been a St. Kitts tourism professional for over 20 years. Mrs. Taylor-Williams holds a Diploma in Hotel & Tourism Management from UWI as well as certifications in Human Resources Management, French, Tourism Projects in Rural Areas and Community Development in Tourism. She is currently an advisory board member for the St. Christopher National Trust, former director of the St Christopher Air & Sea Ports Authority (SCASPA) board, Chair of the CTO’s Sustainable Tourism Technical Committee, and the Chair of the St. Kitts and Nevis Tourism and Related Services Technical Committee on Standards. As Assistant Permanent Secretary to the Ministry of Tourism, Mrs. Taylor-Williams liaises with the private and public sectors to ensure a successful and responsible tourism product. She has dedicated her professional life to tourism in St. Kitts and has been an integral part of the Ministry of Tourism since 1995. She serves as the focal point for the St. Kitts Sustainable Tourism development program as well as the Chair of the St. Kitts Sustainable Destination Council and representative of the Heart of St. Kitts Foundation. For as long as she can remember, Bryanna Hylton has revelled in the idea of speaking. Starting with JCDC Speech Festivals from as early as four years old, she blossomed and has learnt to channel her love for public speaking into something beautiful and truly enriching. Having been a student of the Westwood High School for girls in Stewart Town, Trelawny Jamaica since 2012, she served as Monitor, Prefect, Head Girl and, now, President of the Sixth Form Association. Through her tenure, she made the best use of her talent and maintained a seat on the honour roll at all times. Contrary to popular belief, the seventeen year old Taurian spends the majority of her free time watching movies with her favourite being, “The Hunger Games Series” which was originally written by Suzanne Collins. Her involvement in school activities range from the School’s Challenge Quiz Club to the Debating Society where she participated in the Burger King School’s Debate and secured four best speaker titles. Additionally, she is a member of the Girl Guides Association and is a member of the Youth Department at her church in St. Ann. In February 2018 she became a member of the Tourism Action Club (TAC) instituted at her school, being one of over 105 TACs situated across Jamaica and managed by the Jamaica Tourist Board (JTB). Through her school club she entered the CTO Youth Congress competition also managed and coordinated by the JTB, to compete against 9 fellow TAC members and was named among the top 3 participants to move on to the finals. Her passion for public speaking was recognised very early in the local competition in her confident and smooth delivery of her insightful presentation on the chosen topic, ‘Wellness Tourism’. Throughout the training workshop she was very focused, hardworking and determined to succeed. She successfully emerged the winner of the local competition copping the title “Junior Minister of Tourism for Jamaica 2018” and subsequent Caribbean title. She is a go-getter who seeks to make the world a better place for everyone regardless of gender, socio-economic background, colour or creed. Hats off to Bryanna! Jason Howard is a 2 star Michelin experienced Chef, best known for creative menu development and plating inspired on Modern Caribbean cuisine. Trained in classic and modern French techniques and pioneering his own culinary approach and methods to Caribbean food. His work has taken him to Barbados, Italy, South Africa, Germany, Spain, USA and Jamaica with other countries lined up for his expertise and private dining events. • Food consultancy, chef training and mentoring. • Food stylist and menu makeover. • Speaking and presentation on caribbean cuisine. In addition he is working to raise the profile of Caribbean food to showcase through a network of chefs in the UK & Caribbean and industry professionals. Through heading up the Caribbean Culinary Collective a platform showcasing the best of chef and mixology talent from that region. As well as book writing he is also working on developing a pioneering concept of Rum dining, centred around menu creation for rum inspired dishes and food pairing. Howard worked a sous chef, previously at The Connaught Hotel for the two star Michelin chef ,HÉLÈNE DARROZE and he has more than 14 years experience working in 4 and 5 star hotels in Barbados, before coming to London, specialises in fusing the Caribbean food and flavours of his background in a deconstructed way, delivered on par with the excellence found only in Michelin and 5 star establishments. 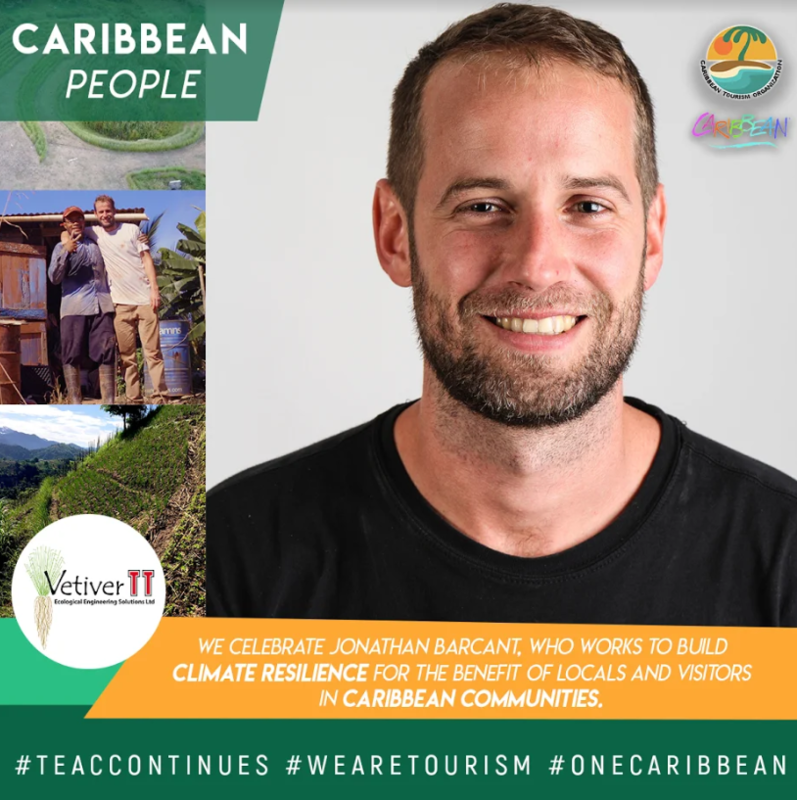 Jonathan Barcant is the founder of a green-engineering company called Vetiver TT Ecological Engineering Solutions Ltd, and also cofounded an NGO called IAMovement which has become one of the leading civil society voices on climate change in T&T – and since 2018 has begun stretching beyond to other Caribbean islands. Vetiver TT offers project design, education and implementation for cost-effective plant based solutions using vetiver grass, to tackle a wide range of soil and water related challenges such as erosion and landslides, which can also cause infrastructure and property damage, topsoil loss and flooding. Vetiver grass’ roots can grow to 10 feet deep in 2 years making it a powerful bio-engineering tool to help build climate resilience in rural communities, especially on small islands which are experiencing more extreme weather. 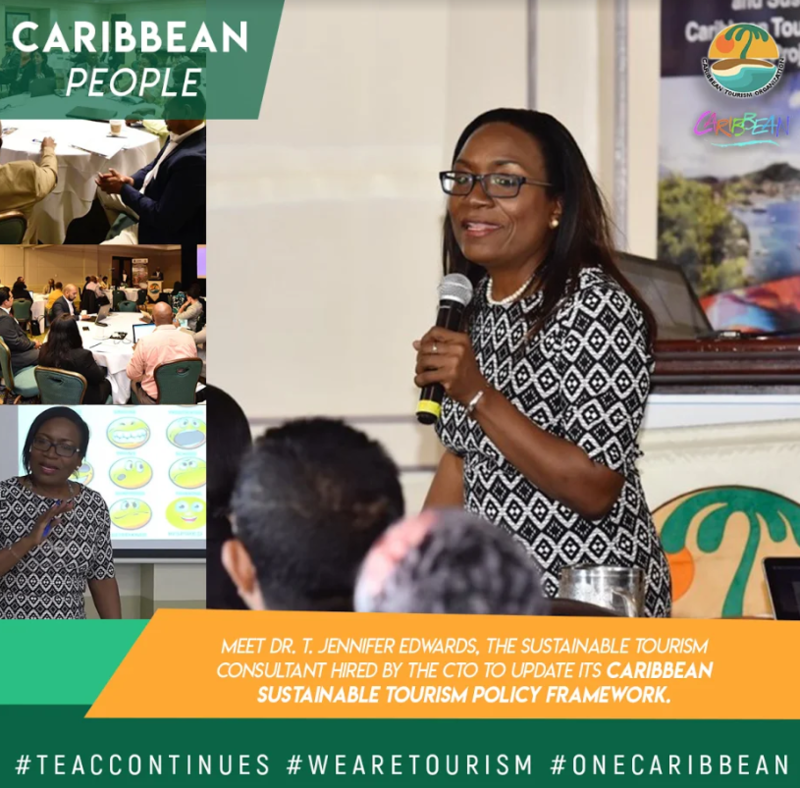 Hired by CTO to update the Caribbean Sustainable Tourism Policy Framework, Dr Edwards, an expert in sustainable tourism, continues to contribute to the development of Caribbean tourism in which she has been involved for over 25 years. A national of Trinidad and Tobago and a past lecturer in sustainable tourism at the University of the West Indies, Dr Edwards, who resides in The Bahamas, has supported not only human resource development for tourism within the region, but she has also contributed to public and private sector development across the Caribbean including the enhancement of small and medium enterprises to better service and benefit from regional tourism development. Working in her area of specialisation, Dr Edwards has further support CARICOM, the OECS and regional sustainable tourism development through her involvement with a range of programmes and development projects supported by agencies such as the Inter-American Development Bank; the World Bank; the Commonwealth Secretariat; the European Commission; the Ford Foundation; the Caribbean Export Development Agency; the Caribbean Regional Organisation for Standards & Quality (CROSQ); the European Union/Centre for the Development of Enterprise/Technical Centre for Agriculture and Rural Cooperation; the UN/World Trade Organisation/International Trade Centre; and the United Nations Environment Programme/Global Program of Action; the European Commission. According to Dr Edwards “the Caribbean has what it takes to remain competitive in the now extremely diversified and dynamic tourism industry. I believe though that partnerships and effective engagement and involvement of the people of the region are key elements in the continued development of tourism within the Caribbean and certainly in its sustainability”. Dr Edwards completed her PhD in Environmentally Managed Tourism at the University of Bradford, England, her MSc in Tourism Marketing at the University of Surrey, England and her BSc in Tourism Management at the University of the West Indies. She has certified proficiency in Environmental Management Systems and is a Chartered Marketer and a qualified Hospitality Assured Assessor with the Caribbean Tourism Organisation. Francis Wade is the founder of CaribHRForum Community and the owner of Framework Consulting. His firm specializes in interventions related to employee engagement, strategic planning, productivity and process management, doing work with regional companies like BakersBay Golf and Beach Resort in the Bahamas. Francis has Bachelors and Masters degrees from Cornell University and taught research at the graduate level at the University of Phoenix. He speaks to a variety of audiences and will be featured at the Association for Talent Development Conference in Washington DC in 2019. He is the author of Perfect Time-Based Productivity which became an Amazon top ten bestseller in the time management category. He lives in Jamaica and writes a regular column on productivity in the Gleaner newspaper.